The 2019 Arizona Fall League rosters were announced this afternoon and the Yankees are sending seven players to the desert this year: RHP Domingo Acevedo, IF Thairo Estrada, OF Estevan Florial, RHP Jordan Foley, RHP Hobie Harris, IF Steven Sensley, and RHP Matt Wivinis. One or two players may still be added to the roster, as is the case every year. Florial, the Yankees’ No. 2 prospect, is the headliner here. He missed roughly two months with wrist surgery earlier this season and is hitting .278/.377/.415 (129 wRC+) with six home runs in 80 games this season, mostly with High-A Tampa. Florial hit .286/.383/.414 in 19 AzFL games last year and is returning this year to make up the at-bats he lost due to injury. Various injuries have limited Estrada to only 18 games this season and I’m glad to see he’s healthy and going to the AzFL. Been a tough year for him. Estrada was shot in the hip during a robbery in January, then missed time with groin, back, and wrist problems during the regular season. Last year Estrada hit a strong .342/.381/.430 in 20 AzFL Games. Acevedo, like Florial, is going to the AzFL to make up for lost time. A blister and a biceps injury have limited him to 69.1 innings this season, most with Double-A Trenton, during which he’s pitched to a 2.99 ERA (3.22 FIP with 20.0% strikeouts and 6.1% walks. Acevedo pitched in the AzFL back in 2015. The fact he’s going this year suggests he will not be a September call-up. Rarely do guys do both. Interestingly enough, Sensley is listed on the roster as an infielder, indicating his move to first base was not a short-term thing. 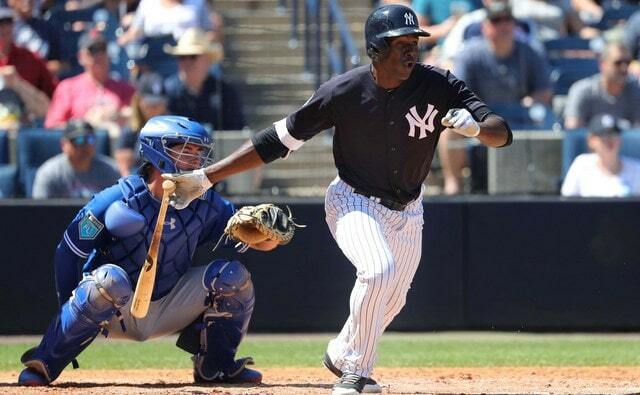 He was drafted as an outfielder last year before moving to first base with High-A Tampa this year. Sensley is hitting .246/.330/.445 (121 wRC+) with 16 home runs in 107 games split between Low-A Charleston and High-A Tampa. Foley, Harris, and Wivinis are are fringe prospect depth relievers. Foley has a 3.18 ERA (4.22 FIP) with 23.0% strikeouts in 62.1 innings this year, all in Trenton. Harris has a 2.53 ERA (4.03 FIP) in 46.1 innings between Tampa and Trenton. Wivinis has a 2.56 ERA (2.86 ERA) and 34.4% strikeouts in 52.2 innings at three levels this season. These guys are roster fillers more than legit prospects getting a longer look. Yankees prospects will play for the Glendale Desert Dogs in the AzFL this year. They’ll be on a team with Dodgers, Indians, Orioles, and White Sox prospects. The 30-game AzFL schedule begins Tuesday, October 9th, and runs through Thursday, November 15th. The Championship Game will be played Saturday, November 17th. Louisiana-Lafayette OF Steven Sensley (12th) has signed, reports William Weathers. No word on his bonus, though there’s no reason to think it’s above the $125,000 slot for picks after the tenth round. Scouting director Damon Oppenheimer called Sensley his draft sleeper. “We like his exit velo, power, athleticism,” he said to Randy Miller. Exit velo for a college kid! Anyway, Sensley hit .314/.417/.576 with eleven homers in 57 games this spring. Maryland HS RHP Harold Cortijo (14th) has signed. His high school coach posted a photo of the contract signing on Twitter. No word on the bonus, though I think there’s a chance Cortijo will get more than the $125,000 slot. He was said to be very committed to junior college, which would have allowed him to re-enter the draft next year. Rhode Island C Chris Hess (17th) has signed, according to the school’s Twitter feed. Again, no word on the bonus, though as with Sensley, odds are it is not over $125,000. Hess hit .347/.414/.581 with eight homers and 12 steals in 53 games as a senior this spring. Georgia HS Pat DeMarco (24th) is not planning to sign, according to his Twitter feed. He’s one of the highly ranked players who slipped to Day Three due to signability concerns. DeMarco grew up in New York City, graduated high school in Georgia, and is committed to Vanderbilt. Lane College LHP Austin Crowson (26th) has not yet decided whether to turn pro, according to Steve Mims. “Not sure yet, still discussing everything. I’m going to take my time,” he said. Crowson is at a junior college, so he could re-enter the draft next year. Norfolk State RHP Alex Mauricio (27th) has signed, according to his dad’s Twitter feed. No word on his bonus yet and chances are we’ll never find out. These under-slot late rounders are rarely reported. Mauricio hit .345/.427/.528 this spring and had a 3.49 ERA with 55 strikeouts in 59.1 innings. The Yankees drafted him as a pitcher. Louisiana HS SS Hayden Cantrelle (40th) wants to “keep his options open,” reports Trey Labat. Cantrelle has a number in mind, and if the Yankees meet it, he’ll sign. He’s a legitimate football prospect in addition to baseball, and he made it no secret he wants to go to college. Our Draft Pool Tracker page is up and running. You can use that to keep tabs on the bonus pool situation between now and the July 7th signing deadline. The Tracker is available at all times under the Resources pull down menu in the nav bar at the top of the site.